Lately, I’ve been going to Latin Mass instead of the new mass. Latin Mass feels like home to me. It feels like a call to holiness. Every detail of the Latin Mass has meaning, not just to me, but to everyone who’s studied scripture. The words, the gestures, the artifacts like the communion rail all have deep meaning. I don’t think the new mass is heretical; I just don’t think it lifts us up toward God. Silence. Before mass, silence. During mass, silence. After mass, silence. Room for God to speak to us. “Speak, Lord, they servant heareth,” not “Listen, Lord, thy servant speaks!” This seems more appropriate than roar of the novus ordo congregation, because I can pray in the presence of the body and blood, soul and divinity of Jesus in the tabernacle. With most churches locked when there’s not a mass going on, this is a rare treat. Sanctity. Even a devout atheist would recognize that the believers are doing something important at a Latin Mass. To believers, we know we are participating in an unbloody re-enactment of Christ’s passion and death on Calvary. The Latin Mass alone treats such a monumental event with appropriate gravitas. Theocentricity, or “God-centeredness.” The Latin Mass is focused exclusively on giving glory and honor to God, not on making the congregants feel better about themselves or demonstrating the game-show-hosting skills of the priest. Sacrifice. The centerpiece of the Latin Mass is our sacrifice of the only thing worth of God: His own sacrifice on our behalf, not the theatrics of the homilist or the creativity of the liturgical director. Reverence. The silence throughout reminds us that we are in the presence of the body and blood, soul and divinity of our Lord and Savior, Jesus Christ, and not at a Lady Gaga concert. Humility. Kneeling for Communion. When we receive the body and blood, soul and divinity of Jesus Christ at the Latin Mass, we demonstrate our unworthiness by kneeling at a communion rail that symbolizes the sacrificial wall of the great temples of Jerusalem. This seems so much more appropriate than having the Host flipped into my greasy palm by some guy wearing a Hawaiian shirt and flip-flops. Beauty. From the vestments to the language to the choreography of the servers and celebrant, the Latin Mass attempts to thank God for the gifts He’s given us by presenting them to Him as beautifully as we can. Missals. The Daily Roman Missal of 1962 contains everything you need for every mass and sacrament for every day of the year for ever and ever. This provides so much more clarity than the nine books, three handouts, and four cards with local variables required to get through the ever-changing, unpredictable, loud, and irreverent novus ordo circus. Consistency. In the Latin Mass, there’s no need to rehearse the congregation’s part before mass. Our part is always the same: to assist the ministerial priest in making a perfect sacrifice as commanded by Jesus as the Last Supper. Salvific. Finally, the pre-Vatican II Church and its beautiful Latin Mass makes its purpose obvious in every movement and word: the church exists, the mass exists, for the greater glory of God and to get you to heaven. If you can’t figure out how what you’re doing is ordered toward one of those two ends, stop and ask a Latin Mass priest, because either you’re doing the wrong thing or you haven’t been properly catechized. If you’d like to experience the Latin Mass, I’ve discovered (thanks to my wife) the Oratory of Saints Gregory and Augustine. The Oratory is located in St. Luke church in Richmond Heights. Visit their website for mass times and much more. 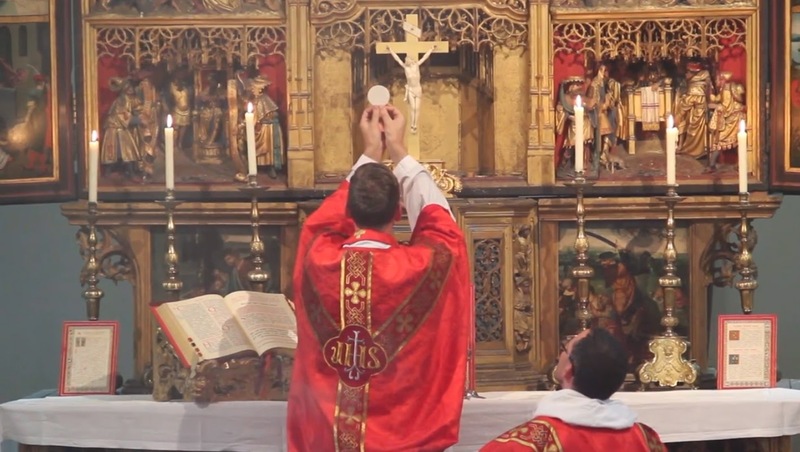 Watch this video by Dr. Taylor Marshall before your first Latin Mass.